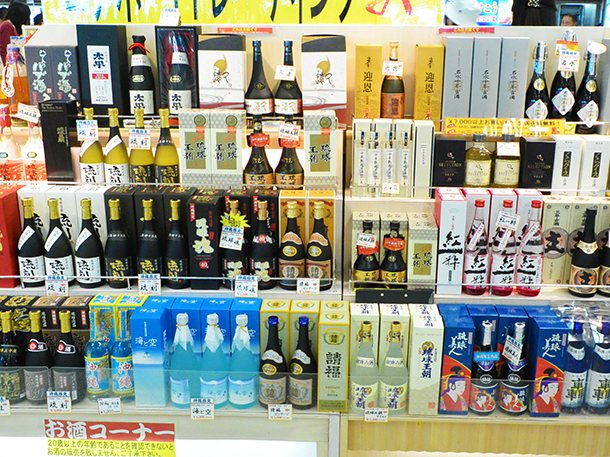 The souvenir assortment is rich at the Naha Airport(那覇空港)! 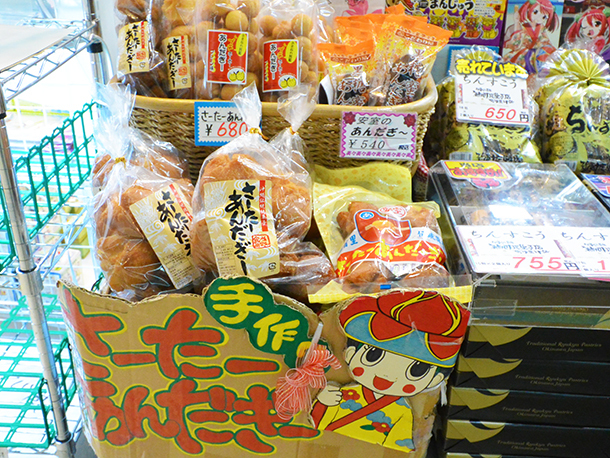 Most of the popular souvenirs you can buy in Okinawa can be found at the Naha airport. This can be very useful if you forget to buy souvenirs on the island! 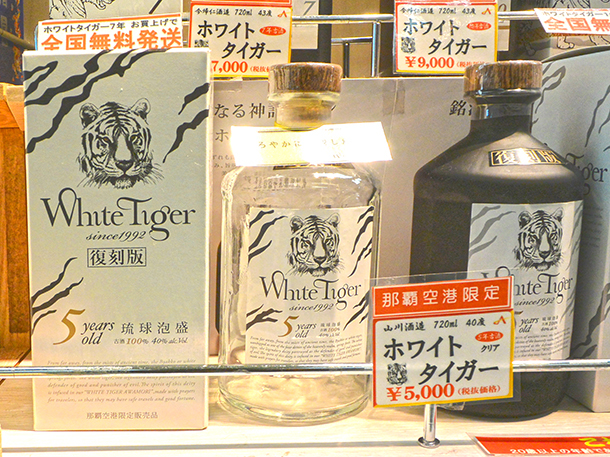 Let me introduce you to what kind of souvenirs are sold at the Naha Airport. Needless to say, this is a very popular souvenir in Okinawa. Made of 100 percent sweet red potato, this tart’s sweet taste and texture are sure to be enjoyed. 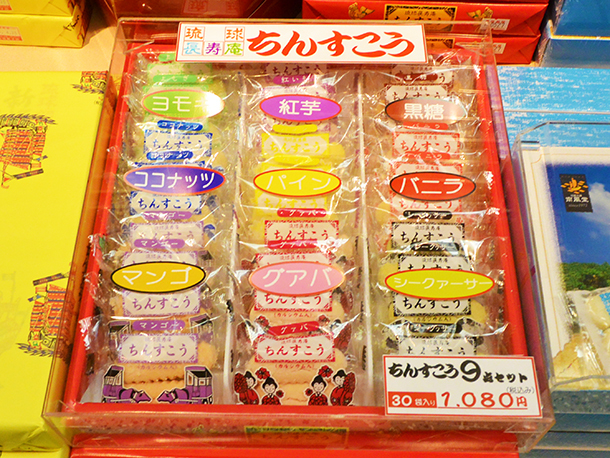 Next to Sweet Red potato tarts, this is Okinawa’s second most favorite souvenir. It comes in so many flavors, such as mango, sweet red potato, Pineapple turmeric, peanut, coffee, black sugar, bitter gourd, and Coconut Vanilla guava. Because there are so many kinds it is easy to find a taste you will like. Okinawa soba makes a delicious cup of noodles. Since it has a long expiration date you can buy a large amount and store it at home. It is a great way to enjoy the Okinawa taste at home. One of Okinawa’s most popular deep-fried pastries. It is like a donut.They are Handmade at “Ryukyu Mura,” located on the second floor of the Airport. 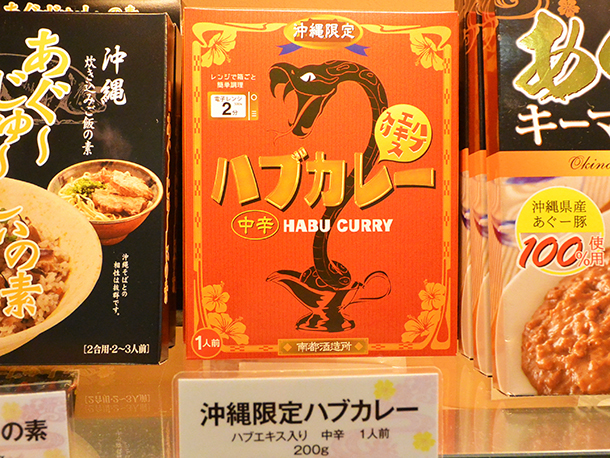 This Curry has the famous Habu extract as one of its ingredients. 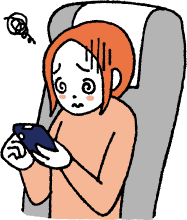 You can select regular or spicy. 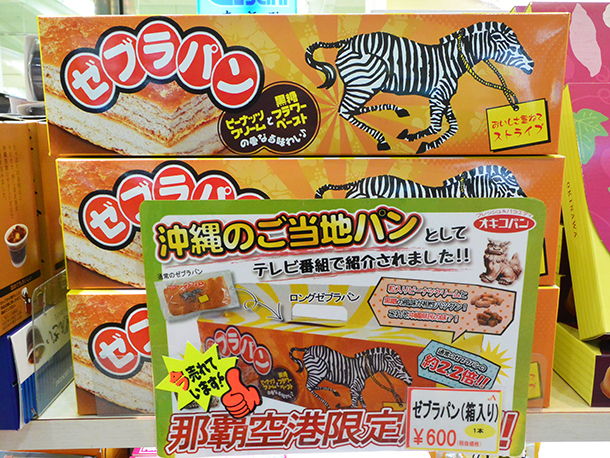 Zeburapan is a pastry that is basically a peanut cream sandwitch. It is named after a zebra because the cross section of bread and crème makes a striped pattern. 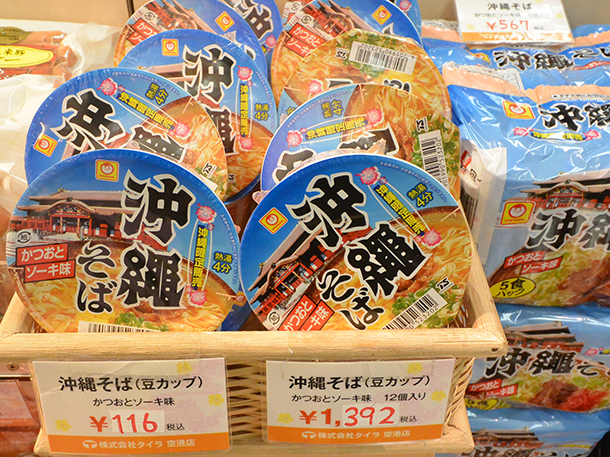 It is a classic taste that has been loved for many years in Okinawa. In Naha Airport, they sell a huge foot long Zeburapan (many times the length of the normal Zeburapan). It is too big to be eaten by just one person. People love this pastry souvenir! 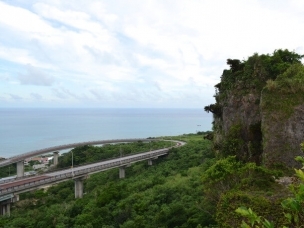 Awamori is a really famous Sake from Okinawa. It has a high alcohol content, with a unique flavor. 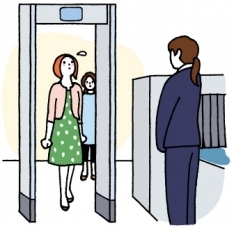 There is a large variety in stock at the Airport, so you can choose several selections. You can only buy this at the airport at “Gurukun Haivi” and at the”Sakurashop,” both located on the second floor of the departure lobby. Sanpin tea is a kind of jasmine tea. Originally Chinese “Sahanpencha. 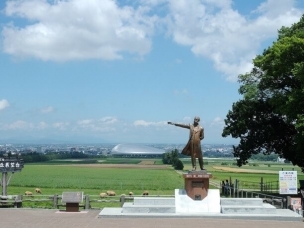 ”The Japanese changed its name Sanpin tea. 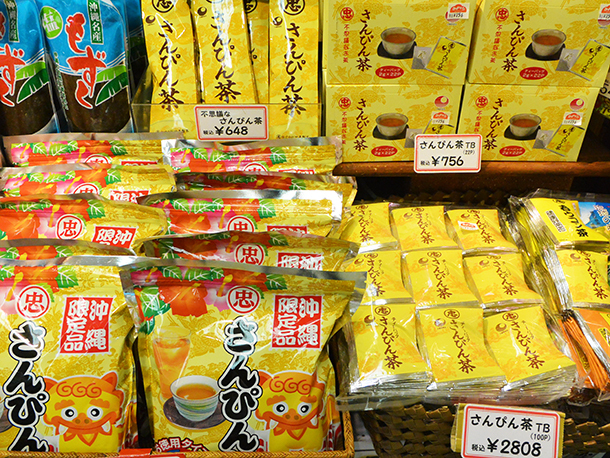 In Okinawa, awamori in Sanpin tea has become a very popular drink. Ornaments and key chains in the shape of a guardian angel Shisa of Okinawa. It comes in many variations and is a good charm to decorate the house. Ryukyu glass tableware and figurines are a special Okinawa craft. There are air bubbles in the glass, that make for a unique texture. Unique Okinawa local Hello kitty and local specter watch straps. They are also sold as key chains. ● Bags and Perfume, etc. 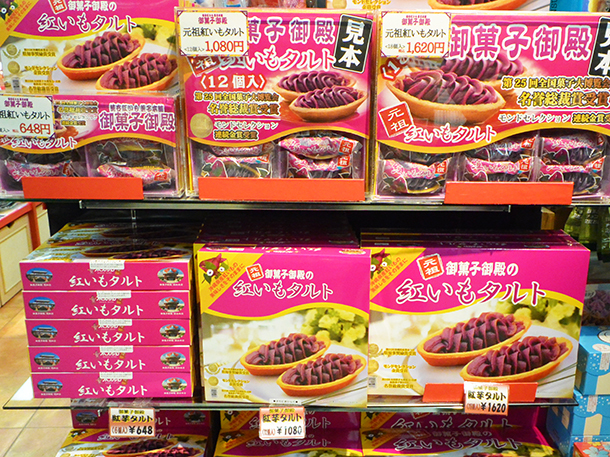 You can find everything from sweet red potato tarts to designer brand products at the Naha airport. So no need to worry about buying souvenirs while you are sightseeing. 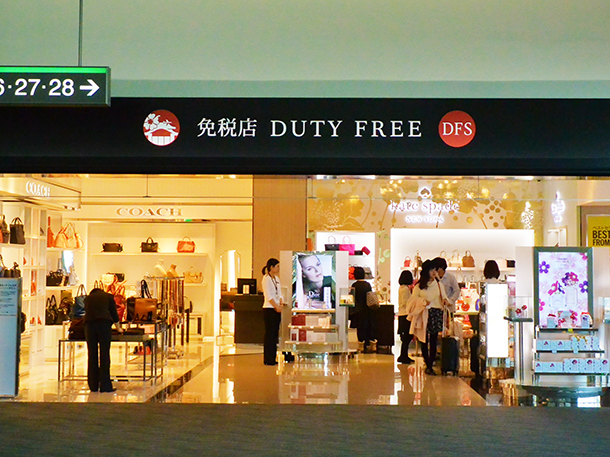 You can wait until you get to the airport and buy what you need from one of Naha Airport’s many shops.